Chimichurri. It is my favorite condiment of late for so many reasons: It’s easy to make. It’s light and fresh. It goes with anything. It adds a vibrant green color to your plate. It’s gluten, grain and dairy free, as well as paleo, vegan, sugar free, and raw! What’s more, the main ingredient — parsley — is a superfood, chock full of vitamins and antioxidants. So what is chimichurri exactly? Chimichurri is a popular Argentinean condiment, typically made with fresh parsley, garlic, olive oil, and vinegar. I give my version of the traditional Argentinean topping a Texas twist with the addition of cilantro, but if you hate cilantro or don’t have any on hand, just double up the parsley and you’ll be fine. 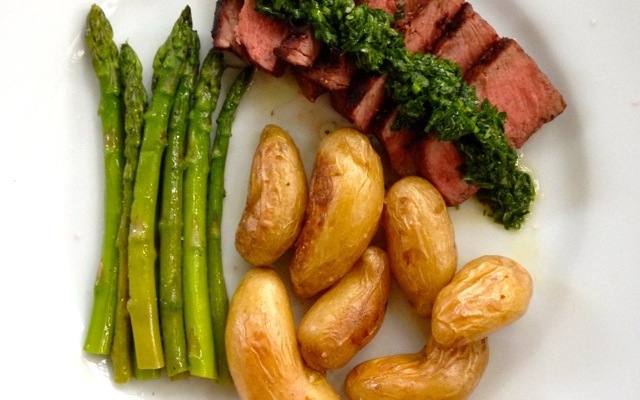 Although chimichurri is traditionally served with steaks, trust me, it goes with anything! Lately we’ve served it on shrimp, steak, salmon, chicken, and BBQ short ribs. I bet it would be delightful on roasted veggies, too. Oh, and if you’re planning a fancy dinner party (…or just by yourself at home with the kids on a Friday at 5pm…womp, womp), you can serve it as an appetizer with store-bought plantain chips and big glass of red wine. Yum. The one question most people ask me about chimichurri is “can you freeze it?” The answer is “yes!” Just like pesto, you can freeze it in an ice cube tray for two to three months, and then defrost individually for later use. Of course, for the best flavor and consistency, make it fresh on the day you plan to use it and let it marinate for at least 30 minutes before serving. Place all ingredients into the jar of a blender or food-processor. Blend until herbs and garlic are finely chopped, and mixture is well-combined. Transfer to bowl. Let marinate at room temperature for at least 30 minutes. Marie! I was at the Covenant MoMs group and was so happy you came to talk with us. I’m making the Pistachio cod tonight! But what really got me was when I started looking for your blog online, I discovered your maiden name–Hejl. My mother is a Hejl. Her father was Raymond Hejl. Family ancestry Czech as well? Crazy. I would love to figure out the family connections. We may be distant cousins! So cool. Can’t wait to look over your blog some more. Your kitchen is to die for!